"'30s" and "thirties" redirect here. For decades comprising years 30–39 of other centuries, see List of decades. 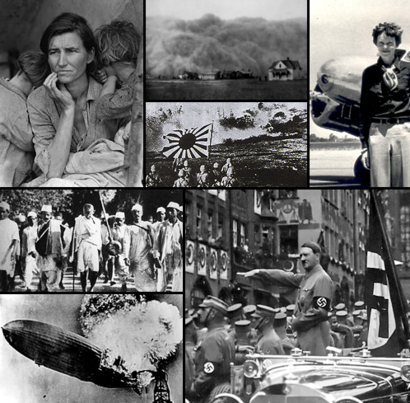 From left, clockwise: Dorothea Lange's photo of the homeless Florence Thompson show the effects of the Great Depression; Due to the extreme drought conditions, the farms become dry and the Dust Bowl spreads through America; The Canton Operation during the Second Sino-Japanese War; Aviator Amelia Earhart becomes an American flight icon; German dictator Adolf Hitler and the Nazi Party attempt to establish a New Order of absolute Nazi German hegemony in Europe, which culminates in 1939 when Germany invades Poland, leading to the outbreak of World War II; The Hindenburg explodes over a small New Jersey airfield, causing 36 deaths and effectively ending commercial airship travel; Mohandas Gandhi walks to the Arabian Sea in the protest Salt March of 1930. Chaco War (15 June 1932 – 10 June 1935) – the war was fought between Bolivia and Paraguay over the disputed territory of Gran Chaco resulting in an overall Paraguayan victory in 1935. An agreement dividing the territory was made in 1938, officially ending outstanding differences and bringing an official "peace" to the conflict. Saudi–Yemeni War (March 1934 – 12 May 1934) – was a war between Saudi Arabia and the Mutawakkilite Kingdom of Yemen. Second Sino-Japanese War (7 July 1937 – 9 September 1945) – fought between the Republic of China and the Empire of Japan. The Second Sino-Japanese War was the largest Asian war in the 20th century. It also made up more than 50% of the casualties in the Pacific War. Chinese Civil War (1927–49) – The ruling Kuomintang and the rebel Communist Party of China fight a civil war for control of China. The Communists consolidated territory in the early 1930s and proclaimed a short-lived Chinese Soviet Republic that collapsed upon Kuomintang attacks, forcing a mass retreat known as the Long March. The Kuomintang and Communists attempted to put away their differences after 1937 to fight the Japanese occupation of China, but intermittent clashes continued through the remainder of the 1930s. Spanish Civil War (17 July 1936 – 1 April 1939) – Germany and Italy back anti-communist Falange forces of Francisco Franco. The Soviet Union and international communist parties (see Abraham Lincoln Brigade) back the left-wing republican faction in the war. The war ends in April 1939 with Franco's nationalist forces defeating the republican forces. Franco becomes Head of State of Spain, President of Government and de facto dictator. The Republic gives way to the Spanish State, an authoritarian dictatorship. Castellammarese War (1929 – 10 September 1931). Adolf Hitler and the Nazi Party rise to power in Germany in 1933, forming a fascist regime committed to repudiating the Treaty of Versailles, persecuting and removing Jews and other minorities from German society, expanding Germany's territory, and opposing the spread of communism. Hitler pulls Germany out of the League of Nations, but hosts the 1936 Summer Olympics to show his new Reich to the world as well as the supposed superior athleticism of his Aryan troops/athletes. Neville Chamberlain, Prime Minister of the United Kingdom (1937–1940), attempts the appeasement of Hitler in hope of avoiding war by allowing the dictator to annex the Sudetenland (the German-speaking regions of Czechoslovakia), later signing the Munich Agreement and promising constituents "Peace for our time". He was ousted in favor of Winston Churchill in May 1940, after the Invasion of Norway. The assassination of the German diplomat Ernst vom Rath by a German-born Polish Jew triggers the Kristallnacht (Night of Broken Glass) which occurred between 9 and 10 November 1938, carried out by the Hitler Youth, the Gestapo, and the SS, during which much of the Jewish population living in Nazi Germany and Austria was attacked – 91 Jews were murdered, and between 25,000 and 30,000 more were arrested and sent to Nazi concentration camps. Some 267 synagogues were destroyed, and thousands of homes and businesses were ransacked. Kristallnacht also served as the pretext for the wholesale confiscation of firearms from German Jews. Germany and Italy pursue territorial expansionist agendas. Germany demands the annexation of the Federal State of Austria and of other German-speaking territories in Europe. Between 1935 and 1936, Germany recovers the Saar and re-militarizes the Rhineland. 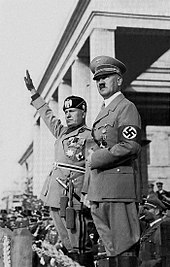 Italy initially opposes Germany's aims for Austria, but in 1936 the two countries resolve their differences in the aftermath of Italy's diplomatic isolation following the start of the Second Italo-Abyssinian War, Germany becoming Italy's only remaining ally. Germany and Italy improve relations by forming an alliance against communism in 1936 with the signing of the Anti-Comintern Pact. Germany annexes Austria in the event known as the Anschluss. The annexation of the Sudetenland followed negotiations which resulted in the Munich Agreement of 1938. The Italian invasion of Albania in 1939 succeeds in turning the Kingdom of Albania into an Italian protectorate. The vacant Albanian throne was claimed by Victor Emmanuel III of Italy. Germany receives the Memel territory from Lithuania, occupies what remains of Czechoslovakia, and finally invades the Second Polish Republic, the last of these events resulting in the outbreak of World War II. In 1939, several countries of the Americas, including Canada, Cuba, and the United States, controversially deny asylum to hundreds of German Jewish refugees on board the MS St. Louis who are fleeing the Nazi regime's racist agenda of anti-Semitic persecution in Germany. In the end, no country accepts the refugees, and the ship returns to Germany with most of its passengers on board. Some commit suicide, rather than return to Nazi Germany. Franklin D. Roosevelt is elected President of the United States in November 1932. Roosevelt initiates a widespread social welfare strategy called the "New Deal" to combat the economic and social devastation of the Great Depression. The economic agenda of the "New Deal" was a radical departure from previous laissez-faire economics. The Kingdom of Hejaz and Nejd is proclaimed the Kingdom of Saudi Arabia, concluding the country's unification under the rule of Ibn Saud. The Republican parties win the local elections, and proclaim the Second Republic, kicking out the monarchy of Alfonso XIII of Borbón. The Spanish coup of July 1936 against the Republic marks the beginning of the Spanish Civil War. The Ethiopian Empire is invaded by the Kingdom of Italy during the Second Italo-Abyssinian War from 1935 to 1936. The occupied territory merges with Eritrea and Italian Somaliland into the colony of Italian East Africa. The Empire of Japan captures Manchuria in 1931, creating the puppet state of Manchukuo. A puppet government was created, with Puyi, the last Qing dynasty Emperor of China, installed as the nominal regent and emperor. In March 1930 Mohandas Gandhi leads the non-violent Satyagraha movement in the Declaration of the Independence of India and the Salt March. The Government of India Act 1935 creates new directly elected bodies, although with a limited franchise, and increases the autonomy of the Presidencies and provinces of British India. The NSDAP (Nazi Party) under Adolf Hitler wins the German federal election, March 1933. Hitler becomes Chancellor of Germany. Following the 1934 death in office of Paul von Hindenburg, President of Germany, Hitler's cabinet passed a law proclaiming the presidency vacant and transferred the role and powers of the head of state to Hitler as Führer und Reichskanzler (leader and chancellor). The Weimar Republic effectively gives way to Nazi Germany, a Totalitarian autocratic national socialist dictatorship. The Great Depression seriously affects the economic, political, and social aspects of society across the world. Major conflict occurs across the world such as the Chaco War, the Second Italo-Abyssinian War, the Spanish Civil War, the Chinese Civil War, the Second Sino-Japanese War, and the outbreak of World War II on September 1, 1939. Collapse of the League of Nations as countries like Germany, the Kingdom of Italy, and the Empire of Japan abdicate the League. In 1930, Miguel Primo de Rivera, Prime Minister of Spain and head of a military dictatorship is forced to resign in response to a financial crisis (part of the Great Depression). Alfonso XIII of Spain, who had previously backed the dictatorship, attempts to return gradually to the previous system and restore his prestige. This failed utterly, as the King was considered a supporter of the dictatorship, and more and more political forces called for the establishment of a republic. In 1931, republican and socialist parties won a major victory in the local elections, while the monarchists were in decline. Street riots ensued, calling for the removal of the monarchy. The Spanish Army declared that they would not defend the King. Alfonso flees the country, effectively abdicating and ending the Bourbon Restoration phase which had started in the 1870s. A Second Spanish Republic emerges. In the Soviet Union, agricultural collectivization and rapid industrialization take place. 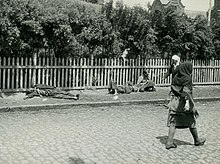 Millions died during the Holodomor. More than 25 million people migrate to cities in the Soviet Union. Anglo-German Naval Agreement is signed in 1935, removing the Treaty of Versailles' level of limitation on the size of the Kriegsmarine (navy). The agreement allows Germany to build a larger naval force. Éamon de Valera introduces a new constitution for the Irish Free State in 1937, effectively ending its status as a British Dominion. The "Great Purge" of "Old Bolsheviks" from the Communist Party of the Soviet Union takes place from 1936 to 1938, as ordered by Soviet Union leader Joseph Stalin, resulting in hundreds of thousands of people being killed. This purge was due to mistrust and political differences, as well as the massive drop in Grain produce. This was due to the method of collectivization in Russia. The Soviet Union produced 16 million lbs of grain less in 1934 compared to 1930. This led to the starvation of millions of Russians. The 1937 World's Fair in Paris, France displays the growing political tensions in Europe. The pavilions of the rival countries of Nazi Germany and the Soviet Union face each other. Germany at the time was internationally condemned for Luftwaffe (its air force) having performed a bombing of the Basque town of Guernica in Spain during the Spanish Civil War. Spanish artist Pablo Picasso depicted the bombing in his masterpiece painting Guernica at the World Fair, which was a surrealist depiction of the horror of the bombing. Referendum in the Irish Free State in December 1937 on whether Ireland should continue to be a constitutional monarchy under King George VI or to become a republic results in citizens voting in favour of a republic, ending the remains of British sovereignty through monarchial authority over the state. Hertzog of South Africa, whose National Party had won the 1929 election alone, after splitting with the Labour Party, received much of the blame for the devastating economic impact of the depression. Canada and other countries under the British Empire sign the Statute of Westminster in 1931, establishing effective parliamentary independence of Canada from the parliament of the United Kingdom. United States Marine Corps general Smedley Butler confesses to the U.S. Congress in 1934 that a group of industrialists contacted him, requesting his aid to overthrow the U.S. government of Roosevelt and establish what he claimed would be a fascist regime in the United States. 1939 New York World's Fair, USA displays the pavilions showing art, culture and technology from the whole world. Newfoundland voluntarily returns to British colonial rule in 1934 amid its economic crisis during the Great Depression with the creation of the Commission of Government, a non-elected body. Canadian Prime Minister W. L. Mackenzie King meets with German Führer Adolf Hitler in 1937 in Berlin. King is the only North American head of government to meet with Hitler. Amelia Earhart receives major attention in the 1930s as the first woman pilot to conduct major air flights. Her disappearance for unknown reasons in 1937 while on flight prompted search efforts which failed. In 1932, the Polish Cipher Bureau broke the German Enigma cipher and overcame the ever-growing structural and operating complexities of the evolving Enigma machine with plugboard, the main German cipher device during World War II. Getúlio Vargas became the President of Brazil after the 1930 coup d'état. Major international media attention follows Mohandas Gandhi's peaceful resistance movement against the British colonial rule in India. Chinese Communist Party leader Mao Zedong forms the small enclave state called the Chinese Soviet Republic in 1931. The Gandhi–Irwin Pact is signed by Mohandas Gandhi and Viceroy of India, Lord Irwin on March 5, 1931. Gandhi agrees to end the campaign of civil disobedience being carried out by the Indian National Congress (INC) in exchange for Irwin accepting the INC to participate in roundtable talks on British colonial policy in India. The Government of India Act of 1935 is enacted by the Governor-General of India, separating British Burma to become a separate British possession and also increasing the political autonomy of the remaining presidencies and provinces of British India. Mao Zedong's Chinese communists begin a large retreat from advancing nationalist forces, called the Long March, beginning in October 1934 and ending in October 1936 and resulting in the collapse of the Chinese Soviet Republic. Colonial India's Muslim League leader Muhammed Ali Jinnah delivers his "Day of Deliverance" speech on December 2, 1939, calling upon Muslims to begin to engage in civil disobedience against the British colonial government starting on December 12. Jinnah demands redress and resolution to tensions and violence occurring between Muslims and Hindus in India. Jinnah's actions are not supported by the largely Hindu-dominated Indian National Congress whom he had previously closely allied with. The decision is seen as part of an agenda by Jinnah to support the eventual creation of an independent Muslim state called Pakistan from British Empire. Australia and New Zealand sign the Statute of Westminster in 1931 which established legislative equality between the self-governing dominions of the British Empire and the United Kingdom, with a few residual exceptions. The Parliament of Australia and Parliament of New Zealand gain full legislative authority over their territories, no longer sharing powers with the Parliament of the United Kingdom. The China floods of 1931 was one of the deadliest natural disasters ever recorded. The German dirigible airship Hindenburg exploding in 1937. The Dust Bowl dust storm approaches Stratford, Texas, in 1935. The 1935 Labor Day Hurricane makes landfall in the Florida Keys as a category 5 hurricane; it was the most intense hurricane to ever make landfall in the Atlantic basin. It caused an estimated $6 million (1935 USD) in damages, and killed around 408 people. The hurricane's strong winds and storm surge destroyed nearly all of the structures between Tavernier and Marathon, and the town of Islamorada was obliterated. The German dirigible airship Hindenburg explodes in the sky above Lakehurst, New Jersey, United States on May 6, 1937. 36 people are killed. 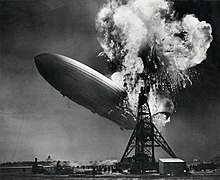 The event leads to an investigation of the explosion and the disaster causes major public distrust of the use of hydrogen-inflated airships and seriously damages the reputation of the Zeppelin company. The New London School in New London, Texas, is destroyed by an explosion, killing in excess of 300 students and teachers (1937). The New England Hurricane of 1938, which became a Category 5 hurricane before making landfall as a Category 3. The hurricane was estimated to have caused property losses estimated at US$306 million ($4.72 billion in 2010), killed between 682 and 800 people, and damaged or destroyed over 57,000 homes, including famed actress Katharine Hepburn's, who had been staying in her family's Old Saybrook, Connecticut, beach home when the hurricane struck. The Dust Bowl, or Dirty Thirties: a period of severe dust storms causing major ecological and agricultural damage to American and Canadian prairie lands from 1930 to 1936 (in some areas until 1940). Caused by extreme drought, coupled with decades of extensive farming without crop rotation, fallow fields, cover crops, or other techniques to prevent erosion, and heavy winds, it affected an estimated 100,000,000 acres (400,000 km2) of land (traveling as far east as New York and the Atlantic Ocean), caused mass migration (which was the inspiration for the Pulitzer Prize-winning The Grapes of Wrath by John Steinbeck), food shortages, multiple deaths and illness from sand inhalation (see History in Motion), and a severe reduction in the going wage rate. The 1938 Yellow River flood pours out from Huayuankou, China in 1938, inundating 54,000 km2 (21,000 sq mi) of land, and takes an estimated 500,000 lives. French president Paul Doumer is assassinated in 1932 by Paul Gorguloff, a mentally unstable Russian émigré. U.S. presidential candidate Huey Long is assassinated (1935). Engelbert Dollfuss, Chancellor of Austria and leading figure of Austrofascism, is assassinated in 1934 by Austrian Nazis. Germany and Italy nearly clash over the issue of Austrian independence despite close ideological similarities of the Italian Fascist and Nazi regimes. Alexander I of Yugoslavia is assassinated in 1934 during a visit to Marseille, France. His assassin was Vlado Chernozemski, a member of the Internal Macedonian Revolutionary Organization. The IMRO was a political organization that fought for secession of Vardar Macedonia from Yugoslavia. The Great Depression is considered to have begun with the fall of stock prices on September 4, 1929 and then the stock market crash known as Black Tuesday on October 29, 1929, and lasted through much of the 1930s. The entire decade is marked by widespread unemployment and poverty, although deflation (i.e. falling prices) was limited to 1930-32 and 1938-39. Prices fell 7.02% in 1930, 10.06% in 1931, 9.79% in 1932, 1.41% in 1938 and 0.71% in 1939. Economic interventionist policies increase in popularity as a result of the Great Depression in both authoritarian and democratic countries. In the Western world, Keynesianism replaces classical economic theory. In an effort to reduce unemployment, the United States government created work projects such as the Civilian Conservation Corps (CCC) which was a public work relief program that operated from 1933 to 1942 to maintain National Parks and build roads. Other major U.S. government work projects included Hoover Dam which was constructed between 1931 and 1936. Rapid industrialization takes place in the Soviet Union. Prohibition in the United States ended in 1933. On December 5, 1933, the ratification of the Twenty-first Amendment repealed the Eighteenth Amendment to the United States Constitution. Drought conditions in Oklahoma and Texas caused the Dust Bowl which forced tens of thousands of families to abandon their farms and seek employment elsewhere. On March 8, 1930, the first frozen foods of Clarence Birdseye were sold in Springfield, Massachusetts, United States. In 1931, RCA Victor introduced the first long-playing phonograph record. In 1935, the British London and North Eastern Railway introduced the A4 Pacific, designed by Nigel Gresley. Just three years later, one of these, No. 4468 Mallard, would become the fastest steam locomotive in the world. In 1935, Kodachrome is invented, being the first color film made by Eastman Kodak. In 1936, The first regular high-definition (then defined as at least 200 lines) television service from the BBC, based at Alexandra Palace in London, officially begins broadcasting. Nuclear fission discovered by Otto Hahn, Lise Meitner and Fritz Strassman in 1939. The Volkswagen Beetle, one of the best selling automobiles ever produced, had its roots in Nazi Germany in the late 1930s. Created by Ferdinand Porsche and his chief designer Erwin Komenda. The car would prove to be successful, and is still in production today as the New Beetle. In 1935, Howard Hughes, flying the H-1, set the landplane airspeed record of 352 mph (566 km/h). In 1937, flying the same H-1 Racer fitted with longer wings, ambitious Hughes set a new transcontinental airspeed record by flying non-stop from Los Angeles to Newark in 7 hours, 28 minutes, and 25 seconds (beating his own previous record of 9 hours, 27 minutes). His average ground speed over the flight was 322 mph (518 km/h). The chocolate chip cookie was developed in 1938 by Ruth Graves Wakefield. The Frying Pan was the first electric lap steel guitar ever produced. Edwin Armstrong invented wide-band frequency modulation radio in 1933. The Bass guitar was invented by Paul Tutmarc of Seattle, Washington, in 1936. Clyde Tombaugh identifies Pluto, which goes on to be announced as the ninth planet in the solar system. Notable literature includes F. Scott Fitzgerald's Tender Is the Night (1934), T. H. White's The Sword in the Stone (1938), J. R. R. Tolkien's The Hobbit (1937), Aldous Huxley's Brave New World (1932), John Steinbeck's Grapes of Wrath (1939) and Of Mice and Men (1937), Ernest Hemingway's To Have and Have Not (1937), John Dos Passos's U.S.A trilogy, William Faulkner's As I Lay Dying (1930) and Absalom, Absalom! (1936), John O'Hara's Appointment in Samarra (1934) and Butterfield 8 (1935). Notable "hardboiled" crime fiction includes Raymond Chandler's The Big Sleep, Dashiell Hammett's The Maltese Falcon, James M. Cain's The Postman Always Rings Twice (1934). Notable plays include Thornton Wilder's Our Town (1938). Popular comic strips which began in the 1930s include Captain Easy by Roy Crane, Alley Oop by V. T. Hamlin, Prince Valiant by Hal Foster, and Flash Gordon by Alex Raymond. David Alfaro Siqueiros paints the controversial mural América Tropical (full name: América Tropical: Oprimida y Destrozada por los Imperialismos, or Tropical America: Oppressed and Destroyed by Imperialism) (1932) at Olvera Street in Los Angeles. Walt Disney's Snow White and the Seven Dwarfs was released in 1937. The Little Princess was released in 1939. In the art of film making, the Golden Age of Hollywood entered a whole decade, after the advent of talking pictures ("talkies") in 1927 and full-color films in 1930: more than 50 classic films were made in the 1930s: most notable were Gone With The Wind and The Wizard of Oz. Universal Pictures begins producing its distinctive series of horror films, which came to be known as the Universal Monsters, featuring what would become iconic representations of literary and mythological monsters, the horror films (or monster movies) included many cult classics, such as Dracula, Frankenstein, The Mummy, Dr. Jekyll and Mr. Hyde, King Kong, The Hunchback of Notre Dame, and other films about wax museums, vampires and zombies, leading to the 1941 film The Wolf Man These films led to the stardom of stars such as Bela Lugosi, Lon Chaney Jr, and Boris Karloff. Recurring series and serials included: The Three Stooges, Laurel and Hardy, the Marx Brothers, Tarzan, Charlie Chan and Our Gang. In 1930, Howard Hughes produces Hell's Angels (film), the first movie blockbuster to be produced outside of a professional studio, independently, as well as becoming the most expensive movie made, at that time, costing roughly 4 million dollars, and taking four years to make. Hell's Angels was an epic masterpiece, valued, and relative to the people at those specific times, of harsh war. On October 30, 1938 Orson Welles' radio adaptation of The War of the Worlds is broadcast, causing panic in various parts of the United States. October 30, 1938 - Orson Welles' radio adaptation of The War of the Worlds is broadcast, causing panic in various parts of the United States. "Delta Blues" music, the first recorded in the late 1920s, was expanded by Robert Johnson and Skip James, two of the most important and influential acts of "Blues" genre. Django Reinhardt and Stéphane Grappelli led the development of Gypsy jazz. Sergei Rachmaninoff composed Rhapsody on a Theme of Paganini in 1934. Charlie Christian becomes the first electric guitarist to be in a multiracial band with Benny Goodman and Lionel Hampton in 1939. Fashion trendsetters in the period included The Prince of Wales (King Edward VIII from January 1936 until his abdication that December) and his companion Wallis Simpson (the Duke and Duchess of Windsor from their marriage in June 1937), socialites like Nicolas de Gunzburg, Daisy Fellowes and Mona von Bismarck and such Hollywood movie stars as Fred Astaire, Carole Lombard and Joan Crawford. The Empire State Building became the world's tallest building when completed in 1931. In Europe during the 1930s and the Great Depression, Surrealism, late Cubism, the Bauhaus, De Stijl, Dada, German Expressionism, Symbolist and modernist painting in various guises characterized the art scene in Paris and elsewhere. 1934 FIFA World Cup was hosted and won by Italy. 1936 Summer Olympics was hosted by Berlin. 1938 FIFA World Cup was hosted by France and won by Italy. 1932 Winter Olympics was hosted by the village of Lake Placid, NY. Chancellor and later Führer Adolf Hitler (Germany) - won a popular election and then established a dictatorship in Germany whose expansionist ambitions lead to the outbreak of World War II in Europe. Emperor Hirohito (Japan) - the last divine Emperor of Japan. President Franklin D. Roosevelt (United States) - initiated major economic reform in the United States. Joe Louis American world heavyweight boxing champion. ^ Zabecki, David T. (1999). World War II in Europe: an encyclopedia. New York: Garland Pub. p. 1353. ISBN 0-8240-7029-1. Archived from the original on 22 December 2016. Retrieved 12 January 2011. ^ A. L. Unger (January 1969). "Stalin's Renewal of the Leading Stratum: A Note on the Great Purge". Soviet Studies. 20 (3): 321–330. doi:10.1080/09668136808410659. JSTOR 149486. ^ "Inflation and CPI Consumer Price Index 1930-1939". Archived from the original on 2014-05-04. ^ "White Chocolate Made Of". www.thenibble.com. Archived from the original on 24 February 2011. Retrieved 2 May 2018. ^ "Howard R. Hughes, Jr.--The Record Setter". www.centennialofflight.net. Archived from the original on 2017-06-30. Retrieved 2017-12-24. ^ Del Barco, Mandalit. Revolutionary Mural To Return To L.A. After 80 Years. Archived 2018-05-02 at the Wayback Machine npr. October 26, 2010. Retrieved June 19, 2015. Lewis, Thomas Tandy, ed. The Thirties in America. 3 volumes. Pasadena: Salem Press, 2011. Wikimedia Commons has media related to 1930s.